WOW $2500 REBATE on a MAVERICK X3 RC - 64" trail width, 120HP, 30" Tires, Warn Winch and much more!! The biggest, baddest obstacles are finally within reach. 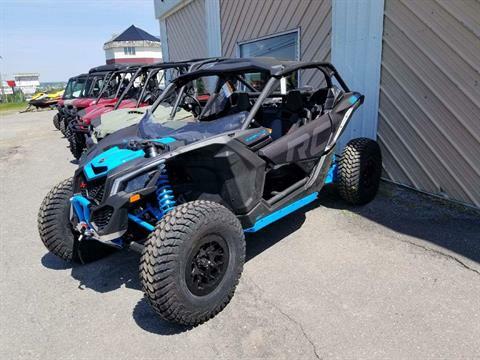 The Maverick X3 X rc Turbo rated at 120 HP is the ultimate side by side for performance and control to conquer rough, rocky terrain and leave rivals at the bottom of the heap. 4500lb warn winch standard in an integrated front bumper, Large 30" Maxxis Liberty tires for added ground clearance. Dynamic power steering for easy and quick steering in tight trails. Plus the power and performance of the Rotax 900 inline triple cylinder fuel injected engine Turbocharged for smooth torque and acceleration. The Maverick X3 series is unparrelled in ride comfort with over 20" of wheel travel. Stop by and test drive this unique Side By Side vehicle today! 64 IN. WIDTH OF ULTIMATE PERFORMANCE: At a commanding 64 in. of width, the X3 X rc Turbo puts stability at the center of everything it does. With race-winning geometry and advanced suspension, wheels, and tires working in concert, the only obstacle you’ll really face is the one staring back in the rearview mirror. 120 HORSEPOWER TURBOCHARGED ROTAX® ACE ENGINE: Responsive, refined performance is more accessible than ever with the 120 horsepower Maverick X3 X rc Turbo. With a turbocharged Rotax engine tuned for torque and seamless, shift-less power, it's able to rip, rock, and crawl at the command of your right foot. 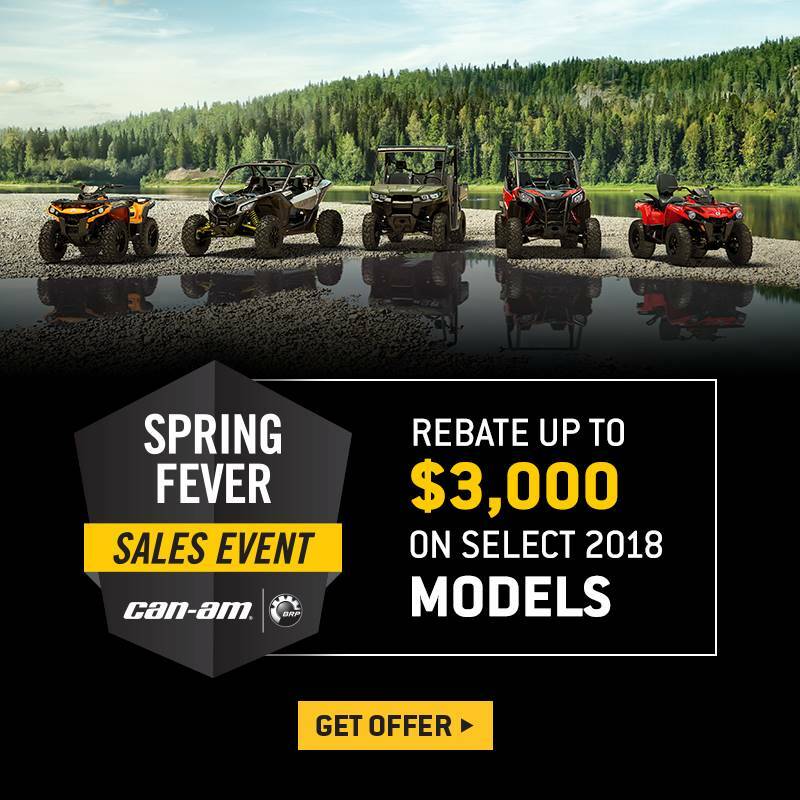 LOCKABLE FRONT DIFFERENTIAL WITH EXCLUSIVE SMART-LOK™ TECHNOLOGY: For next-level traction to conquer the roughest terrain, Can-Am-exclusive Smart-Lok™ technology is the new benchmark. A true full lockable on-the-fly front differential with electronically-controlled automatic modes, or with the simple press of a button that offers preset, intelligent calibrations for your type of riding. Using multiple input sources, "Smart mode” will instantaneously engage locking with the right load at the right moment. Never before have riders been given maximum traction while retaining low-speed maneuverability, allowing optimal placement and a feeling of confidence that allows for the Maverick X3 X rc Turbo to be unleashed sooner than ever. ADVANCED AIRFLOW DYNAMICS: With an intake and exhaust tuned to maximize power, efficiency, and throttle response, the Can-Am Maverick X3 will never be starved for performance. Three oversized, out-of-the-way intakes feed the engine and the CVT with clean air and keep temperatures low, with a sport exhaust out back to let the Rotax ACE engine roar. 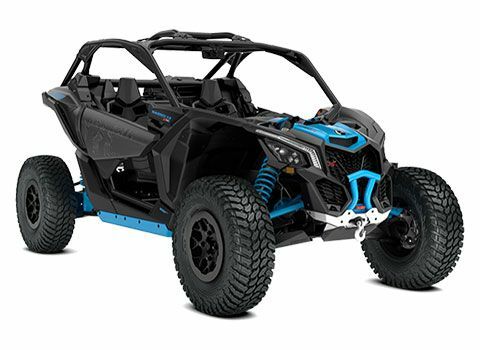 ULTRA EFFICIENT AND LIGHTWEIGHT CHASSIS: The Maverick X3 features an ultralight, rigid chassis anchored by a fully-welded roll cage made of state-of-the-art Dual-Phase 980 steel. So? Figure 53% better torsional stiffness, 20% lighter than its closest competitor—and your confidence at 100%. TTX SUSPENSION WITH INDUSTRY-LEADING TRAVEL AND ARCHED LOWER LINKS: BRP's four-link TTX suspension with 20 in. of travel features a trophy truck-like trailing arm and three links dedicated to controlling camber while delivering optimal geometry at all times, even during extended wheel travel. The result? Unparalleled power transfer to wheels, virtually no bump steer, precise steering response, and more confidence at higher speeds. TRADEMARK CAN-AM DNA WITH NEXT GENERATION DESIGN: The Maverick X3's intensity comes from a mix of performance-driven mechanical and structural design, from its signature LEDs to its advanced cockpit. Here, designers have selected a futuristic bright blue as the hero color for the Maverick X3 X rc Turbo. HIGHLY RESPONSIVE 30 in. MAXXIS LIBERTY TIRES: Considering the other improvements to the Maverick, the latest 30 in. Maxxis Liberty Tires on 14 in. aluminum rims might be overlooked, but their aggressive tread and rugged construction are the key to pushing the X3's capabilities further than ever on very rough ground. FOX 2.5 PODIUM PIGGYBACK SHOCKS WITH QS3 COMPRESSION ADJUSTMENT: The Maverick X3 X rc is equipped with FOX 2.5 Podium Piggyback with QS3 compression adjustment shocks on all four corners, with the rears adding bottom-out control for performance over hilly terrain. Up front, double A-arms with sway bars and 20 in. (50.8 cm) of travel combine with the Can-Am exclusive 4-link Torsional Trailing-arm X (TTX) rear suspension also with 20 in. (50.8 cm) of travel and arched lower links. HIGH MOLECULAR WEIGHT SKID PLATES FOR MAXIMUM PROTECTION: With a full compliment of Heavy-Duty protection gear, from HMW skid plate to UHMW rock sliders, to differential HMW protection and HMW suspension armor, the X rc Turbo has overbuilt HMW parts where you need them most.